It’s always a challenge to decorate a room for a young adult. For starters, my daughter, who is graduating from college, will likely not be living at home for much longer. At the same time, I want her to have a place to call her own in our house and so I’ve been working with her to come up with a room design that will suit all of our needs. While I want the room to fit seamlessly into our French influenced decor, it also needs to honor her personality and taste. We seem to have found a balance by mixing menswear and French frills. I started with an inspiration board incorporating some of the things she likes best. 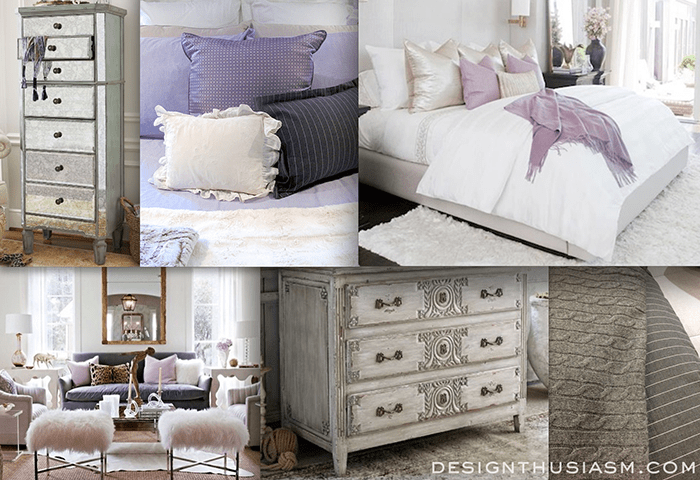 I knew she wanted to stay mostly clean and classic with whites, beiges and greys, adding a touch of lilac for soft interest. 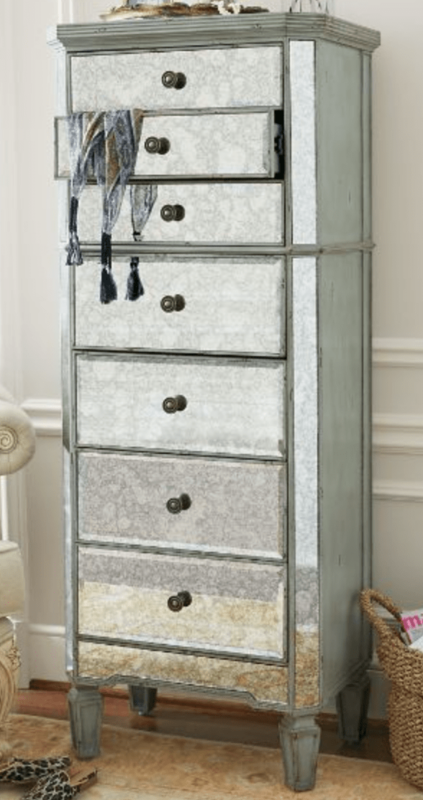 A little bit of gleam via mirrored furniture and lushness through fluffy white fur were also on her list of faves. With the direction outlined, I set about finding the textiles that would capture her unique style. The infusion of menswear patterns was just the thing to express her creative personality with its subtle but edgy approach. 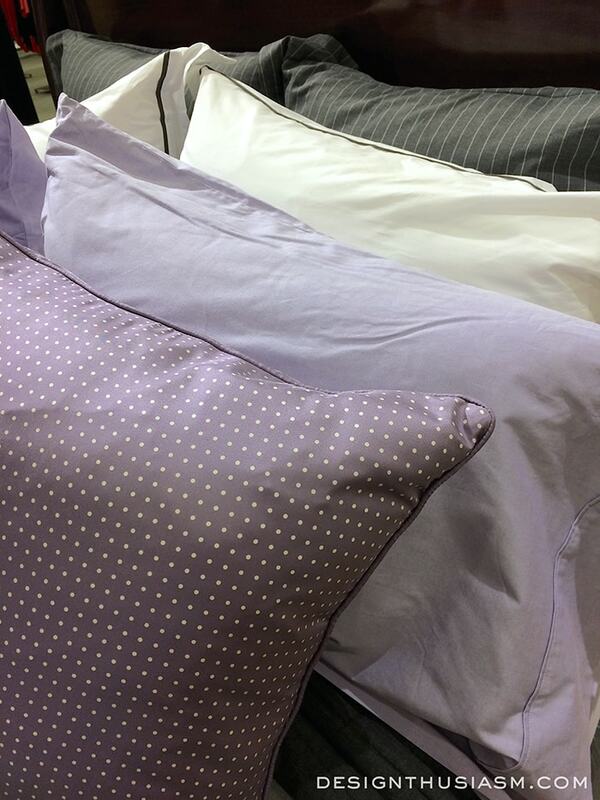 The lilac silk pin dot pillow and charcoal pinstripe, the centerpiece pairing for the room, are both from Ralph Lauren’s Haberdashery Collection. The mix of feminine lilac with the ubiquitous menswear suiting patterns is what gives this look it’s edge. 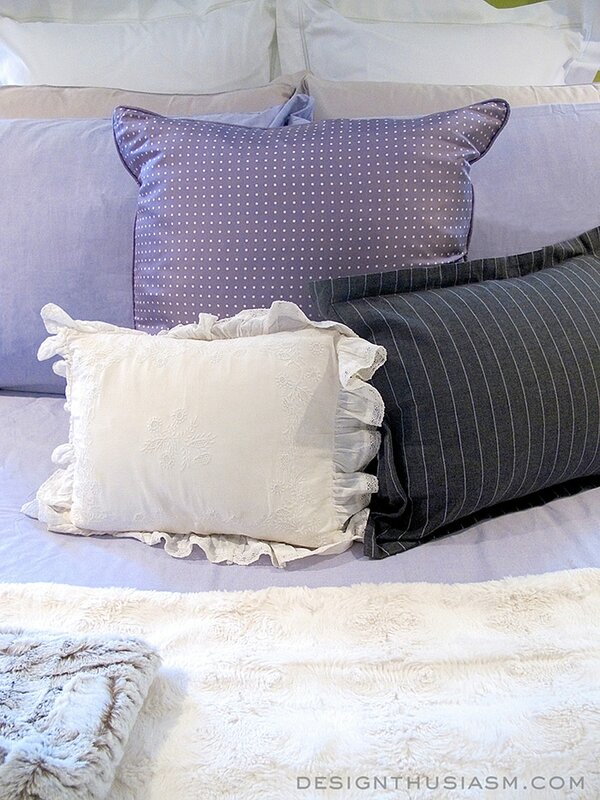 Pillowcases are in lilac oxford weave to further drive home the tailored theme. A cable knit throw in heathered charcoal adds another note of business-like pedigree. 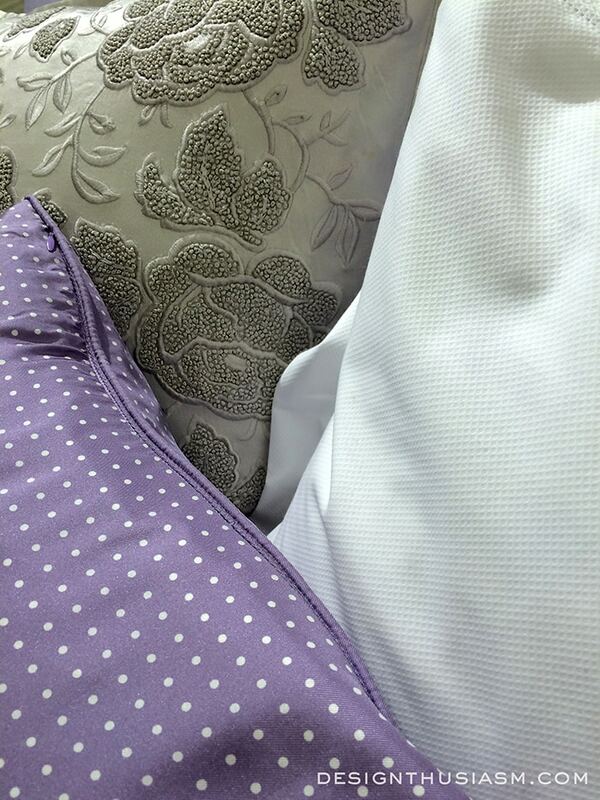 Crisp white pique euro shams contrast nicely against the pattern mix, evoking the feeling of a shirt and tie. 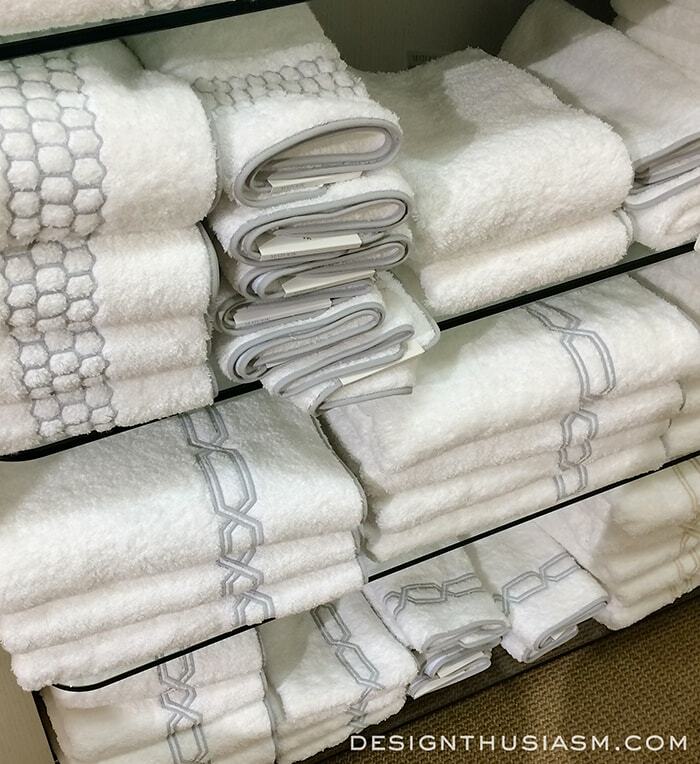 For the adjoining bath we’re looking at clean white towels with simple grey embroidered motifs. On the feminine side, we’ll be balancing the menswear looks with French frills. 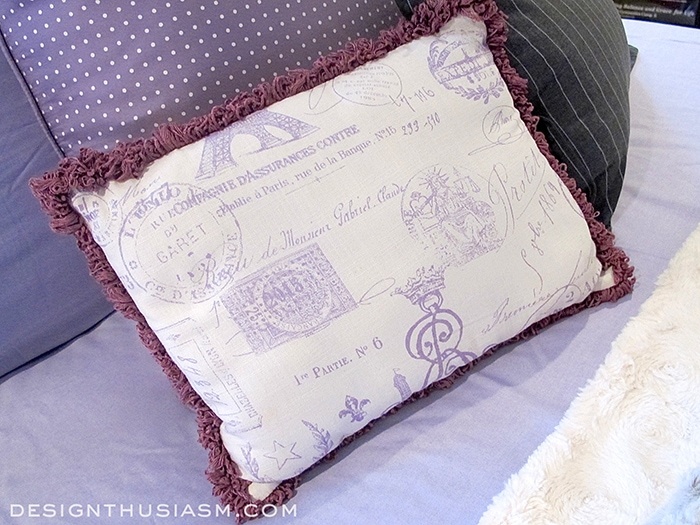 This lilac toile pillow is a perfect contender to bring out the contrast. 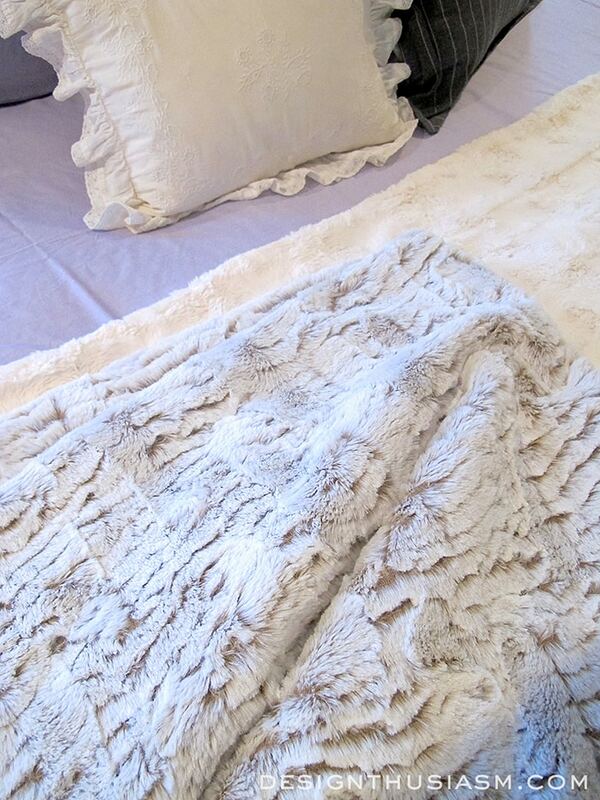 Faux fur throws in whites and creams soften the mens-y edge. 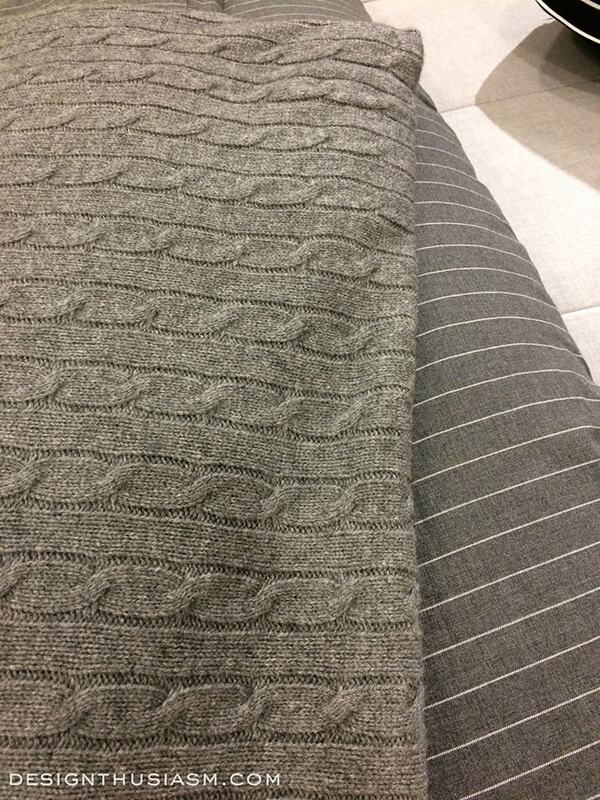 The next step was to search for a bedskirt to work with the textile mix. 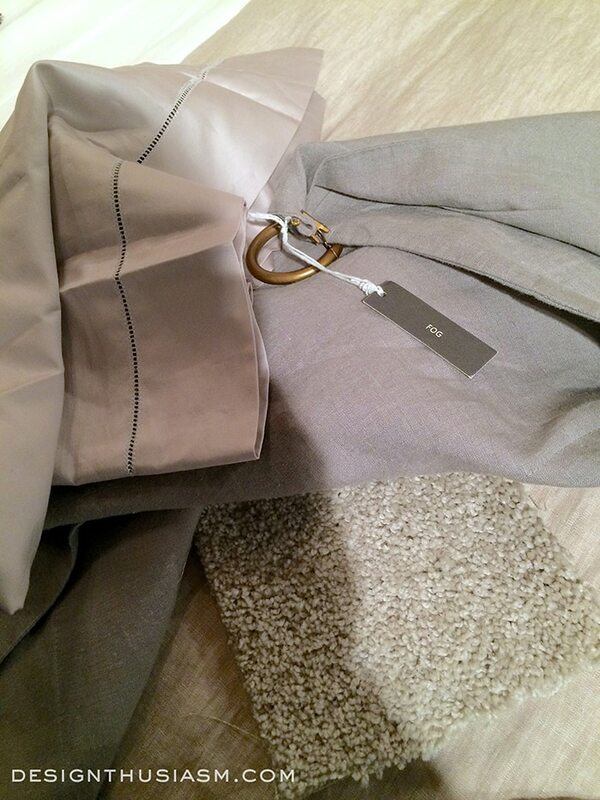 The “fog” washed-linen bedskirt from Restoration Hardware is the perfect color to bring together the warms greys, that are not quite grey and not quite tan. 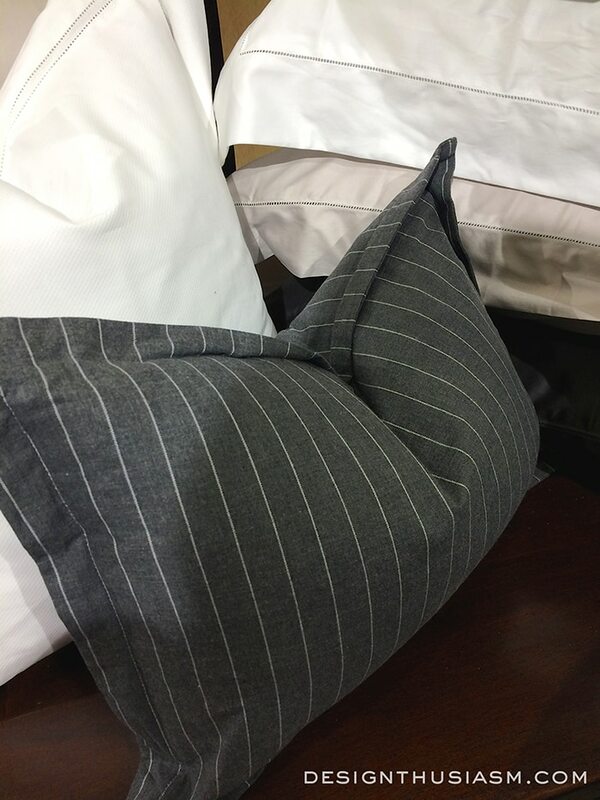 This one little throw pillow gives the entire ensemble its character. Without it, the concept is lost. 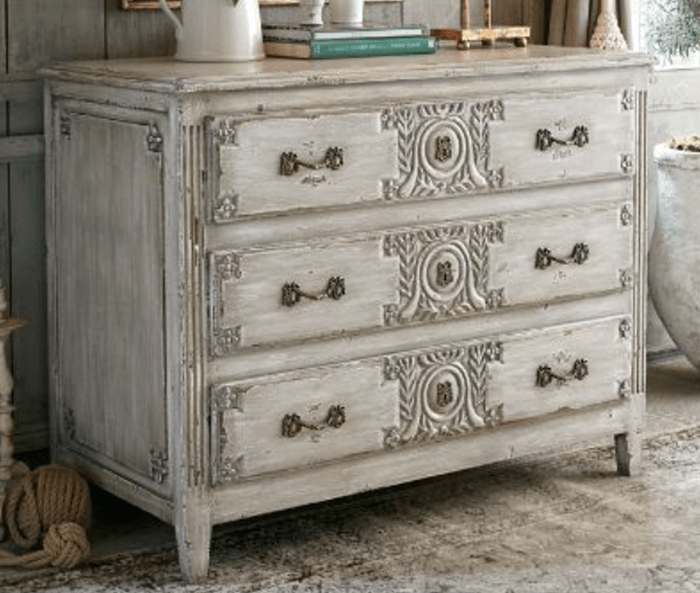 The hard pieces we’re adding include the Grecian chest from Soft Surroundings to work with the gentle whites, as well as the mirrored lingerie chest to add a little note of gleam. 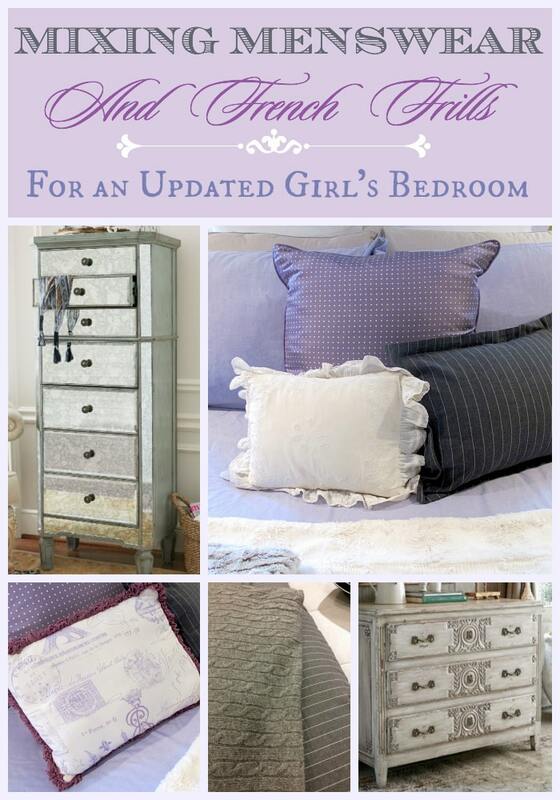 Edited to add: You can see the final reveal in The Lilac and Grey Bedroom.